Dr. APJ AKTU previously known as UPTU announce UPSEE 2017 counselling dates for all course include B.Tech, MBA which will start from 19th June and end on 3rd August 2017last week of July. Total 5 round of counselling will be organized to fill engineering and management seats in top private and government colleges affiliated to AKTU Lucknow Noida Campus. Previously university says "No admission without SSE" but later this point is rejected as maximum college fill more than 50% seats through direct admission without SSE, but now student need more than 60% marks in 12th class board exam to take direct admission. 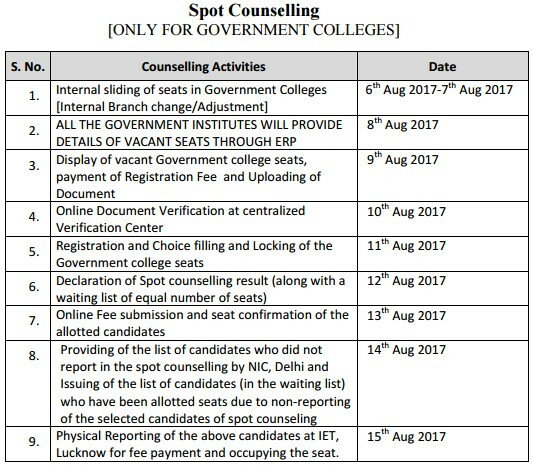 This year special counselling will be organized to fill Dr. APJ AKTU Government Colleges Seats from 6 to 15 August 2017. 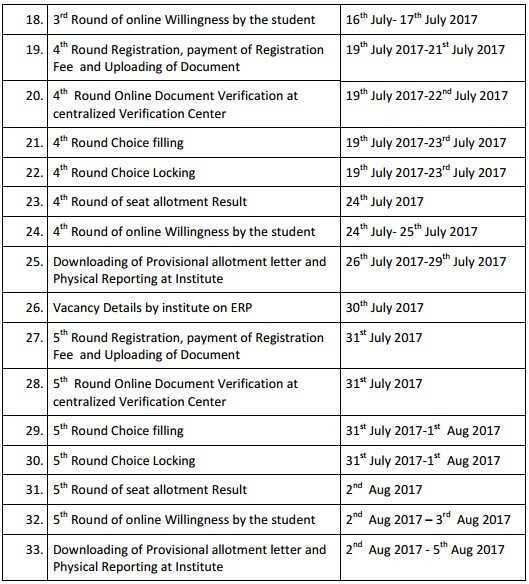 UPSEE 2017 IMPORTANT POINT Counselling Document Verification through Online Process in which Qualify candidate need to have scanned copy of all important certificate which are needed during the admission process like Marksheet, Caste, Domicile Certificate. Scanned document size should be less than 200kb. The counselling for UPSEE 2017 begins from 19th June 2017. 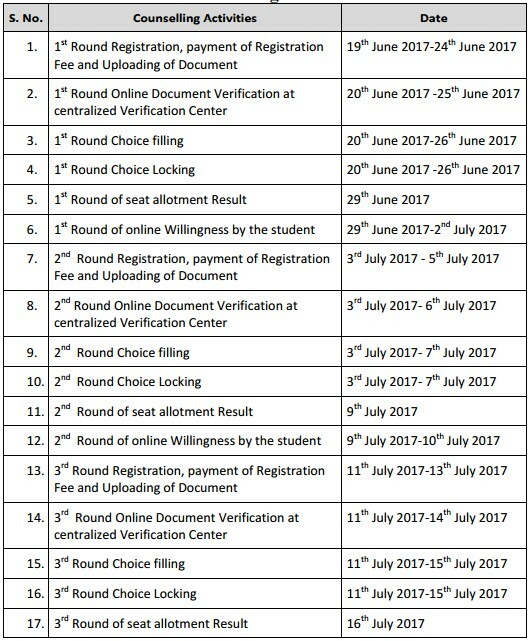 The first round will end on 2nd July, while the second round will be from 3 to 10 July. 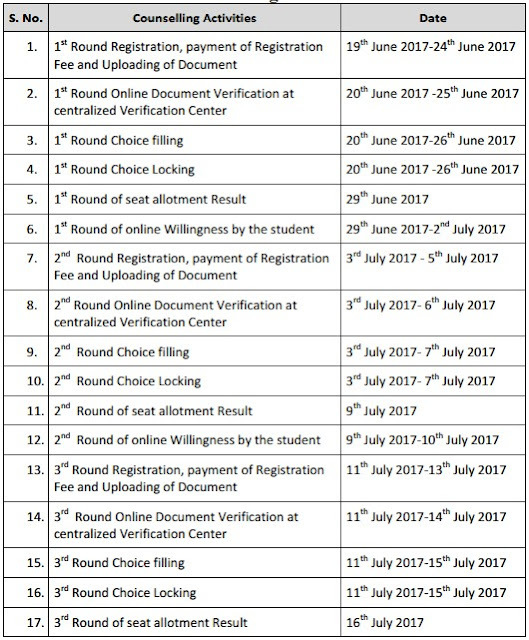 The third round will begin on 11 July and continue till 17 July followed by fourth and fifth rounds starting from 19 to 25 July and 31 July to 3 August respectively. hey I've got GN736 RANK IN UPSEE FOR MBA. WHICH COLLEGES CAN I GET WITH THIS RANK AND HOW TO APPLY FOR THE COLLEGES. Mayank Singh from where you are​ and which clg you want. Sir, I got GNGL rank 423 in upsee 2017. I have UP domicile. Please suggest in which govt college can I get admission in CS branch. Can I got a government collage? I obtained 292 rank in UPSEE B.Arch. What colleges can I expect to get in the counselling? hi, i just got 638GN rank in MBA entrance exam 2017. i just want to know that when counselling will start? I just search on google n uptu official website what didnt get the exact date for the related counselling for MBA. Could anyone guide me? HELLO, I OBTAINED 3400 RANK IN UPSEE B.TECH. WE DON'T KNOWN EXACT DATE OF COUNSELLING OF UPSEE. My gn rank is 26000 nd category rank is 7000 which clg can I get? When will the counselling process will start? I got 26019 rank in general and 1400rank in SC. Could you please tell me what is my counselling date? N mujhe koi govt college mil skta h? Sir..I got GN 1668 nd OBC 600 rank in Bio.Tech. Suggest me can i get government college????? Bhai mai bhi paresan hu verification ko lekal. My documents are not yet verified??? I have to go to any centre for verification or only online it will be verified?? I have uploaded my documents and registration fee is submitted. My doucuments are still not verified..Tell me what to do? after choice locking do we need to go to any verification center with documents or not? if yes can we go to any center of our convenience. my very ficationof documentsis awaited yet while i have deposite fee on 21th of june2017.so how can i fill my choice.it is the fault of aktu.what can i do the seats will be full. My document is not verified yet what can I do?